Imagine that you are in the midst of a WhatsApp group conversation attended by at least 20 friends of yours. Each time a friend sends a message, a new record of data gets created; this new message is time-stamped, tamper-resistant and is accessible to everyone in that definite WhatsApp group. In case you are still wondering what I am up to, let me introduce you to our favorite buzzword ‘Blockchain’, which is stirring the financial world lately. The above example of the group chat was a unique endeavor of IBM to throw some light on the meaning of blockchain. A blockchain is basically a chain of blocks, and more precisely digital information about a money transaction (the ‘block’ or the ‘text message’) stored in a public database (the ‘chain’ or the ‘WhatsApp group’). A blockchain network is widely distributed, that is, it is managed by a cluster of computers or cellphones (called Nodes) and not by a single entity. Due to this lack of a central authority, everyone on a blockchain network can view all the transactions made by different parties. Although transparent and open, the information stored in one block is connected to that stored in another block by cryptographic principles (i.e., the ‘chain’), which secures the information. Also, similar to every message sent in the above-mentioned group chat being unique, no two blocks contain the same set of information. Thus, once constructed, the data contained in a block remain unique, transparent and immutable. The Question Still Remains—How Does it Work? Blockchain is an ingenious and absolutely secure way of storing and passing information from one person to another. A party that makes a transaction initiates the process by creating a block, which will be verified by several computers distributed in the net. The verified block is then added to a chain. To chain a block to another, every block is given a unique digital signature, which corresponds to the data present in the block. A signature links the data present in a particular block to the data present in the next block, thus creating a chain. With every new transaction, many such blocks join up to form a huge network. (In the figure provided below, ‘T’ is ‘transaction’. The signatures that we talked about are created by a cryptographic hash function, which is a complicated formula that takes any string of input and turns them into a unique 64-digit output. As said, these signatures are unique; if any block is altered, a whole new signature has to be assigned. However, for a block to be accepted in a network, it has to be linked to its subsequent blocks, meaning that any change in a particular block will change all the other blocks and their signatures, bringing in the collapse of the whole blockchain. This catastrophic nature is the reason behind blockchains being immutable and, hence, impeccable! In their book Blockchain Revolution, the father and son duo—Don and Alex Tapscott—provides a bird’s eye view of the present and future of blockchain and what revolutionary changes it is going to bring to the world in due course. And the good news is it is one of the perfect books for noobs. Use of Blockchain in Cryptocurrency: How Cryptocurrency Can Change the World? Digitalization has progressed at its highest pace, and now the whole world is going crazy over online shopping, online banking, online transactions and the like. Even money has been digitalized; cryptocurrency is a medium of exchange that has no physical form and exists only in networks. Cryptocurrencies are created and stored in blockchains using encryption techniques, meaning blockchain is the root of these cryptocurrencies. The world’s first decentralized digital currency is Bitcoin (created by Satoshi Nakamoto), the others being Litecoin, Ethereum, Artbytes, Ripple etc. Cryptocurrency is, in fact, the simplest way of leveraging the Blockchain Technology. By spreading the operations of these cryptocurrencies across multiple networks, blockchain allows these digital currencies to be managed without a central authority. This curtails the hurdles of processing or transaction fees and the risks of fall in the value of the currency, not to mention the whole process become unhackable. An alarming number of individuals remain unbanked to date! Inaccessibility to banks has indeed exploded poverty beyond repair. To add to the woes, micro-trading and micro-lending are a big no-no in banks. Global economist, Dr. John Edmunds, rightly says, “While no bank will cash a check for a dollar, sometimes a dollar is all that a person needs”. To reiterate, cryptocurrencies require no banks or central authority to function; therefore, they may allow the unbanked population to engage in global commerce and thus be the ideal solution to the age-old adversity of unbanking and, hence, poverty. Crowdfunding is the use of a small amount of capital from a large body of investors to start a new business. The Blockchain Technology can be put to great use in Crowdfunding, as with this technology revenue can be collected from even the remotest parts of the world. Also, hurdles like taxation and brokerage can be cut down by using Crypto bounties to fulfill the requirements. In 2016, the Ethereum-based Decentralized Autonomous Organization raised an astonishing $200 million USD in just over two months. Thus, Cryptocurrency is digital gold—money that is secure from political influence and money that promises to preserve and increase its value over time. Paul Vigna and Michael J. Casey have explained all about Bitcoin and cryptocurrencies and how are they revolutionizing the industry in their book ‘The Age of Cryptocurrency’. Two other books, ‘Mastering Bitcoin: Unlocking Digital Currency’ and ‘The Internet of Money’—both authored by Andreas M. Antonopoulos—dwell on the evolution and future of Bitcoin. But, Is it Bigger Than ‘Just Cryptocurrency’? It is a new internet, and possibly cannot be confined to ‘just Cryptocurrency’! There are a plethora of other applications of the technology, some waiting to be unveiled and some already on track. In fact, according to the 2018 Global Blockchain Survey conducted by Deloitte among 1,000 companies across seven countries, 34% of the companies already had a blockchain system in production, while 41% is expected to integrate blockchain applications within the coming 12 months. Blockchain Technology can provide a potent, unhackable digital vote-counting system, which will secure the polling booths from corrupted eyes of the Ministers and make the procedure more transparent and convenient. A blockchain-based election can also keep track of voter registration, voters’ identification and the number of votes cast (which go without saying). A novel venture in this field is Follow My Vote. Storing and verifying property ownership through blockchain can ensure security and accuracy of the deal, besides excusing us from the cumbersome process of record-keeping. Moreover, blockchain helps with smart contracts, which are computer codes containing a set of rules. If both the parties agree to the smart contract, the deal gets enforced automatically. Blockchain makes such records and contracts immutable. Smart contracts can help protect copyright and automate the sale of creative work online, eliminating risks like file copying, piracy and redistribution. Due to the encrypted, distributed and tamper-resistant nature of blockchain, if birth certificate, fingerprints, court documents, voice sample and facial pattern any individual are recorded in a blockchain, then the identity of that individual becomes unchangeable! Blockchain-based systems can, therefore, help law enforcement officers in maintaining real-time identity records of criminals in the World Wide Web. Corruption has been the restraining factor that’s pulling every developing nation down. Storing data on a blockchain platform can go a long way in mitigating corruption and providing a transparent Government, as the public will be able to keep a critical eye on every deed of the leaders. According to a survey by Gartner, 82% of reported blockchain applications were in financial services in 2017. Although the number dropped to 46% of reported cases in 2018, financial services are still perceived as the future leader of Blockchain Technology. However, the potential application of the new-age technology can also be witnessed in the manufacturing industry; energy and utility services; healthcare sector; and the Government. Many new applications of the technology will surface in due course. Moving past the basics of Blockchain Technology, cryptocurrency and smart contract, Melanie Swan, the founder of the Institute for Blockchain Studies and DIYgenomics, has tried to answer about how and why Blockchain Technology will be the fifth disruptive force after mainframes, PCs, the Internet and mobile/social networking in her book ‘Blockchain: Blueprint of a New Economy ’. To gather how blockchain will be a superpower in the future, this read is a must. Another good read that tells the same story is “The Truth Machine: The Blockchain and the Future of Everything” by Paul Vigna and Michael J. Casey. 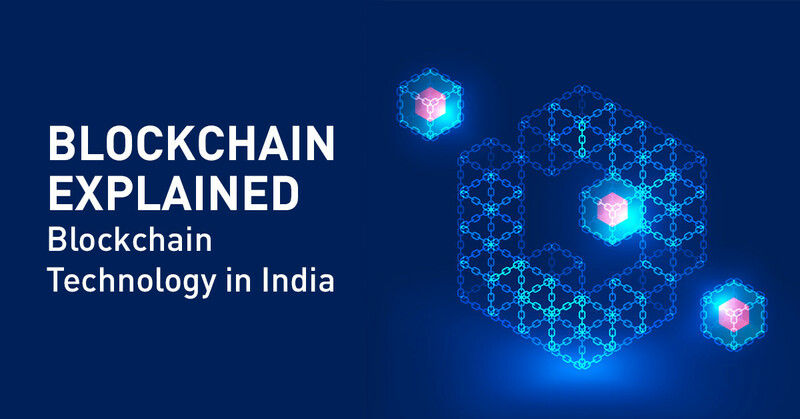 Though Blockchain Technology in India is still in its nascent phase, it can bring a huge difference in how the country runs once it gets incorporated. India is a rising power, and capitalizing on the opportunities of this new Internet can totally bring the country in the Radar of development. The country has too many issues to be taken care of—all in the sectors crucial for an economy to prosper, such as governance, financial services, agriculture, healthcare, real estate and likewise. Blockchain can not only solve them but also add a Midas’s touch! One of the strongest benefits of Blockchain Technology in India is its potential for data protection. With enormous growth in data, especially in Government offices, comes the threats of Cyber attacks and, hence, corruption. Besides this, alteration in votes to gain the majority; illegal immigration; undeclared income and property are some of the hazards that have spread their roots intricately in the system. Adoption of a better and systematic approach, as Blockchain Technology, can be the answer to all these. The country is making quite a rapid progress in terms of blockchain education. According to a market analysis by Dappros (a London-based blockchain consulting firm), India stands at second position in the count of Blockchain Developers (with nearly 19,627 developers), second to the US with 44,979 Blockchain Developers, in the world. This might have given you a rough idea of where blockchain education in India stands today. If you are a blockchain enthusiast or your tech-savvy side is on high, the books ‘Blockchain Basics: A Non-Technical Introduction in 25 Stepsby Daniel Drescher, ‘The Story of the Blockchain: A Beginner’s Guide to the Technology Nobody Understands’ by Omid Malekan, ‘The End of Money: The Story of Bitcoin, Cryptocurrencies and the Blockchain Revolution’ by New Scientist, ‘Cryptocurrency: 5 Expert Secrets for Beginners: Investing into Bitcoin, Ethereum and Litecoin’ by Anthony Tu are indeed meant for you. Blockchain Technology (and cryptocurrency) is here to stay. The field is new and the opportunities jaw-droppingly good. Needless to say, the industry has seen tremendous growth since its invention in 2008. For a clearer picture of its popularity among the general mass, let me show you the numbers. Indeed—one of the most promising job portals—has provided the astounding statistics that blockchain jobs increased by a staggering 207% from December 2016 to December 2017. Extrapolating back, this number has increased by 631% since 2015 (refer to graph). But this is not all. The technology has huge potential—it is, in fact, the start of something revolutionary. Along with a myriad of financial solutions, it has opened up a great lot of career avenues also. Technology giants are now desperately looking for high-quality talents in the field. Let us quickly go through all the opportunities that blockchain has to offer. A Blockchain Developer is the highest paid one in the line. Their approximate annual wage in Silicon Valley, US, is $158k, while in Switzerland it ranges from $120k to 180k. Even freelance consultants get paid from $50 to $100 for an hour’s work. Pretty impressive, right? What does a Blockchain Designer do? He thinks out of the box! As Chris Pallé said, “As Designers, it’s now our job to make the technology disappear and do what we do best—make it usable, useful, meaningful and even surprising and delightful”. With blockchain expanding its horizon, the user interface and design of blockchain are becoming more and more important. Blockchain Designers are expected to design frictionless user experiences (also websites and portals) that connote trust and are appealing to everyday users. For a career in blockchain designing, the following skills are of great necessity: UI designs (web and mobile), manual sketches, PS and Illustrator. The average annual base salary for a blockchain UI/UX Designer in the United States of America is $107,500, with a low base salary of $80,000 and a high base salary of $140,000. A Blockchain Quality Engineer performs various tests to ensure that quality in all areas of blockchain development, such as automation framework testing, manual testing and dashboards, is maintained. Thus, he is responsible for making a blockchain bug- and loophole-free. Blockchain Project managers manage and facilitate various blockchain projects. They cover the entire lifecycle of the project—from initiation to closing—define the objectives, scope, purpose and deliverables of the projects. For the whole project to initiate and for a proper communication between the clientele and researchers, Project Managers are the ones who are to be contacted first; thus, a Project Manager is responsible for the success and failure of the project. They are responsible for translating the need of the companies/clientele into technical terms to the Developers. Besides the traditional expertise of a project manager working in any industry, a Blockchain Project Manager should be thorough with the technical know-hows of blockchain. Also, he should have great communication skills to provide effective updates to the Developers and obtain resources from the clientele. Blockchain is new, and it deals with the tentative subject ‘finance’ (mostly); hence, a Blockchain Legal Consultant becomes mandatory in the scene. Before launching any new blockchain businesses, companies should consult their legal advisors on how business and finance should be handled; how transactions should be tracked and confirmed; and how identity should be managed. A Blockchain Legal Consultant should have a broad understanding of the process from development to implementation. According to a forecast by Gartner, Blockchain Technology will generate an annual business value of over $175 billion by 2025 and rise to over $3 trillion by 2030. With this potential, interest in blockchain careers is expected to reach much more than the recent 207%. The technology that makes the financial system (and everything) impenetrable and offers such alluring career opportunities will no wonder attract everyone’s attention. Independence from the whims and fancies of the centralized financial systems will no longer remain an illusion now. As blockchains can be accessed from every corner of the world that has a PC/cell phone (and a good network coverage), the technology has the potential to bring the unbanked on track, expanding the horizon for trade and commerce from remotest parts of the world. If everything goes well, blockchain will someday form a distributed, transparent and truly democratic economy. However, like every new technology, blockchain is bound to confront challenges—some of which, according to a PwC report, are regulatory uncertainty (48%), lack of trust among users (45%) and inability to bring network together, besides the lack of understanding of what it actually is. Users are also skeptical about its speed, security, scalability, standardization and interoperability. But, hurdles are ineludible. To welcome such a massive change, we need to keep an open mind, trust technology and educate the people. Here’s something to start with. One of the worth mentioning programs is the dual Master’s Degree program in Digital Currency and Blockchain Technology offered by the University of Nicosia in collaboration with iNurture that aims to give students the opportunity to acquire deeper knowledge and skills in the field of digital currency. We need to upskill ourselves, as change is the only constant and those who find it difficult to adapt are usually left behind in the race. Autonomous Robots in India – How Bright Is the Future?